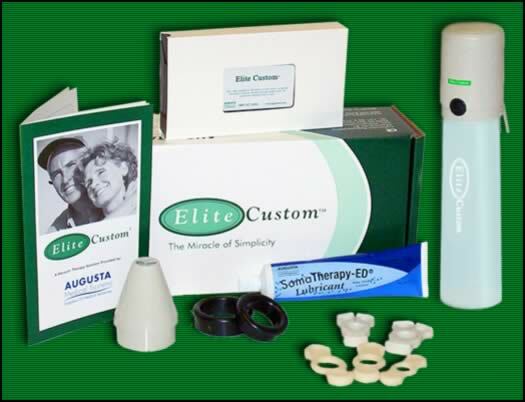 The Elite Custom has been specifically engineered to provide the best vacuum therapy management for Erectile Dysfunction at the lowest possible cost. The Elite Custom vacuum therapy system is the finest available and is recommended as the most conservative, first-line treatment for Erectile Dysfunction. Vacuum Therapy allows the patient the ability to obtain an almost instant erection at his convenience. The Vacuum Cylinder is made of high-grade medical plastic for years of trouble-free use. The five tension systems included with the Elite Custom are designed to provide efficient management of the erection and insures that the patient and his partner have enjoyable intimacy without the fear of losing the erection.